The best way to get to know a community is by scheduling a tour. See the facilities, meet the staff and residents, and get a feel first hand what it's like to live at The Parkside Senior Living Assisted Living. Here at Brookdale Neenah (formerly Sterling House of Neenah), we meet with each new resident to develop a personalized care plan that is based on needs, wants and budget. This plan is continually revisited to guarantee that it remains the right plan no matter how a resident's needs might change. Balancing privacy with a commitment to community, we work every day to ensure an optimal living experience for each resident. Brookdale Neenah is proud to be a member of the Brookdale network. Brookdale has been an industry leader since 1978 and is known across the country for providing superb senior care. Moving into a new home can be daunting, so we have created an environment where our residents always feel safe. Our community is designed to help those with limited mobility enjoy a maximum amount of freedom. We also have an emergency response system located throughout that is monitored continually and even includes emergency pull cords. When family comes to visit, our dedicated family room is available for use. If the weather is nice, everyone can gather in our outdoor courtyard for fresh air and light exercise. And there's no better way to prepare for a family visit than spending some time in our on-site beauty salon or barbershop. At Brookdale Neenah, many of our residents require assistance with basic needs. Whether help is needed with bathing, dressing, grooming, hygiene, dining, medication support or continence management, our professional staff are ready 24/7 to make our residents' lives more manageable. For added comfort and convenience, we offer three meals a day that have been specially formulated to meet our seniors' nutritional needs. We also offer a full program of mentally stimulating educational, cultural and social events. 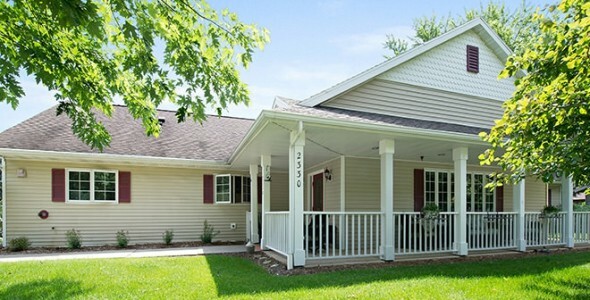 There are many choices when it comes to selecting an assisted living home, but few offer the same level of comfort and care as Brookdale Neenah.